Grunt has been instrumental in streamlining the development of my WordPress plugins, such as the popular Simple Lightbox. This guide shows you how to use Grunt to slay tedious tasks, work smarter, and bring the fun back into developing WordPress plugins. There is much more in-depth information on Grunt available on the web (linked to below), so I’ll keep this short: Grunt handles tedious or repetitive tasks so that you don’t have to. How does Grunt Streamline WordPress Plugin Development? Peruse Grunt’s home page and you’ll see references to several projects, but not WordPress. In fact, it wasn’t until I started using Grunt in Simple Lightbox’s (SLB) development that I realized how perfect Grunt is for handling the particular mix of technologies commonly used in WordPress plugins. Using Simple Lightbox as an example, this article will detail how to get the most out of Grunt when developing a WordPress plugin. Note: This guide demonstrates how Grunt can be used to streamline WordPress plugin development. Familiarity with Grunt would be ideal, but is not required to benefit from this guide. I would recommend Grunt’s Getting Started tutorial (link at the end of this article) if you would like to familiarize yourself with Grunt. Each Grunt task is managed in a separate file to simplify maintenance, so Grunt’s main configuration mostly initializes the aforementioned plugins, preps some variables, and gets out of the way. The plugins will do the heavy lifting from here on out. The Load Grunt Tasks plugin loads all tasks automatically, so once a task-based plugin is installed, it’s ready to go. Time Grunt provides feedback on how long Grunt’s tasks are taking to run. This is an optional but useful plugin that provides insight as to where bottlenecks may be occurring. Let’s start with PHP, as all WordPress plugins have PHP. PHPLint validates PHP code and notifies you about issues that you may have missed. This is a great way to automatically check for issues before you commit a change or release a new update. As we’ll see later, PHPLint is also perfect for automatically validating your plugin’s code on the fly whenever a change is made, informing you of issues immediately and saving you debugging time later on down the road. For additional validation, the -f command is passed to PHP when linting to also check for fatal errors. There are currently only two targets for JSHint. Thanks to Uglify, they no longer have to. By setting Uglify’s mangle option to false, Uglify merely compacts the code– essentially removing unnecessary white space and inline comments. This makes it simple to re-expand the compacted code if anyone ever wants to compare it with the fully-commented version. Over 90% reduction in file size! 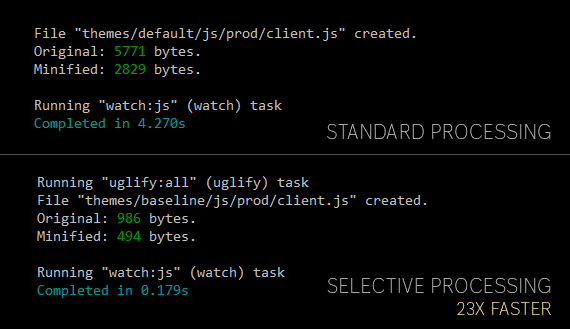 Thanks to Uglify we can have the best of both worlds– full documentation for developers, and fast downloads for end-users. Many WordPress plugins add custom CSS to front-end or admin pages. SLB mostly uses CSS for its custom lightbox themes on the front-end, but also adds a dash of CSS on its admin options page. In lieu of vanilla CSS, SLB uses Sass for all stylesheets. Sass is an excellent CSS preprocessor that makes creating stylesheets faster and easier to maintain. It basically gives you everything you ever wanted in CSS– nesting, variables, and even functions. If you’re not using Sass, you don’t know what you’re missing. As great as it is, Sass files need to be compiled to CSS before they can be used on a web page. Thankfully, Grunt has a plugin for that. Grunt’s Sass plugin is actually what convinced me to start using Grunt in the first place. Employing the impressively fast Libsass engine, the plugin compiles Sass into CSS so much faster than the default Ruby-based compiler that it would be downright silly not to use Grunt. There are two targets defined in the Sass task– one for core styles, and another for theme styles, as I’m usually either working specifically on the core, or specifically on themes. With separate targets, I can save time by only compiling the Sass files I’m currently working on. Once again, we’re using variables to define various paths, but compiling SLB’s core styles is pretty straightforward– find Sass files in the client/sass directory and compile them into the client/css directory. Done. Managing SLB’s theme styles is a bit more involved because each theme has independent sass and css directories where their styles are authored and compiled to respectively. Grunt should not have to be updated every time a new theme is added to SLB, so all Sass files in the themes targeted in bulk. How then do you compile a theme’s Sass file into that theme’s css directory without having to explicitly define the sass/css directory pairs for each theme? Answer: By using the rename option! This option takes a callback function that all processed Sass files are passed through. The file’s path is modified by this function so that the compiled file is saved to the appropriate theme’s css directory. Grunt will handle the rest– validate your code, compile it, compress it, and anything else you tell it to do. This is awesome, why wait until you’re about to release an update for your plugin for these things to happen? Furthermore, why should you even have to type a command for Grunt to jump into action? As the name implies, the Watch plugin monitors a set files and runs a collection of tasks when any of those files are modified. With Watch running (via the grunt watch command), everything is now automated. I can work as usual and Grunt will make sure everything is taken care of. Sass files are automatically compiled to CSS files. The sky is the limit here– anything you configure Grunt to do can be automated by the Watch plugin. By default, Watch runs the tasks you tell it to when any matching file is modified. This can result in wasted resources if a task’s default collection of files are processed or compiled when just one file has been changed. Therefore, to run Grunt tasks as efficiently as possible, the Watch targets can be configured to run tasks only on the file that was modified, instead of all files normally processed by a task. In SLB, an event handler is used so that when a file is updated, only that file is processed by the task it is associated with, leaving all other files untouched. Modify a PHP file and it (and only it) is validated. This is where variables (e.g. paths.js.files) really demonstrate their value. By changing the value of one variable to contain only the modified file’s path, the subsequent task (PHPLint, JSHint, etc.) will only process that file, not the collection of files they were originally assigned. Selective processing is 23x faster! Thanks to Grunt, your WordPress plugin development workflow can be vastly streamlined by automating the “grunt work” involved in maintaining and updating a plugin. Ultimately, this allows you focus on the real work– adding new features, making your plugin better, and releasing updates to users faster. Everyone wins. What do you think? Are you ready to let Grunt work for you? If you already use Grunt for WordPress plugin development, what have you done to streamline your workflow? Simple Lightbox — A dead simple lightbox plugin built specifically for WordPress. Getting Started with Grunt – Automate the tedium out of your projects. Sass — A robust CSS preprocessor that makes stylesheets faster to develop and easier to maintain.